If you don't have time to ta ke a course but still want the professional look, bring your containers and let our designer do the work for you. 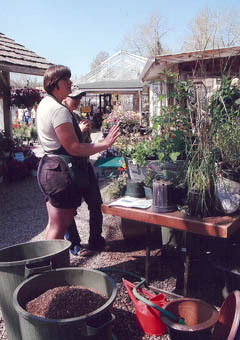 Katrina will carefully choose each plant for your containers so they look stunning all summer long. Bring any container from home that you would like to have professionally filled, or if you need a new container check out our vast array of hi-fired pottery, that Katrina will fill as you wait. 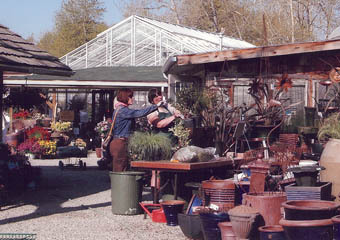 Once you arrive at Vale's Greenhouse please bring your empty container to the filling area, next to the cash desk. 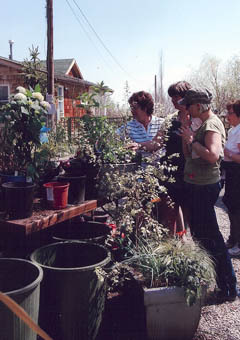 We will then fill the container with new potting mix and consult with you about location, and style. You will need to know where this container, hanging basket or window box is going to sit or hang for the summer season. This service is quick and you will have your new planting home the same day. Once you arrive home you will need to give each planting a good drink of water and leave it outside in a protected area from frost. You may be required to take the container in for the night and out again during the day until risk of frost is over. Follow fertilizing instructions given to you at the time of planting. You may also simply print off a copy of the General Container Care, under "Information" from this web site. Custom Planting Week for the 2019 year runs from May 10 to May 19, 9 a.m. to 5 p.m. The fee is $5.00 per container plus the cost of soil and plant material. No reservations required.